The top command on OS X is pretty crappy.. The one included with most Linux distros allows you to change the sort-by column using < and >, there is a coloured mode (by pressing the z key), and a bunch of other useful options. The obvious answer is "Activity Monitor", but I'm looking for a command line tool! O<skey>        Set secondary sort key to <skey> (see o<key>). I'm currently trying to work out what to do about the licensing clash between Apple's libtop (APSL) and htop (GPL). There's probably not much more programming to do on it - but I may have to re-implement the bits of libtop I need. If anyone has suggestions on how to make the licensing work please speak up. Glances - Eye on your system is what you are looking for. I previously used it on Linux, it is cross-platform and is really good. There is also a brew for htop if that's how you roll. Now you must use e.g. "top -F -R -u". But, hey, Apple's "top" does not sort by cpu by default so perhaps that's the least of its worries. 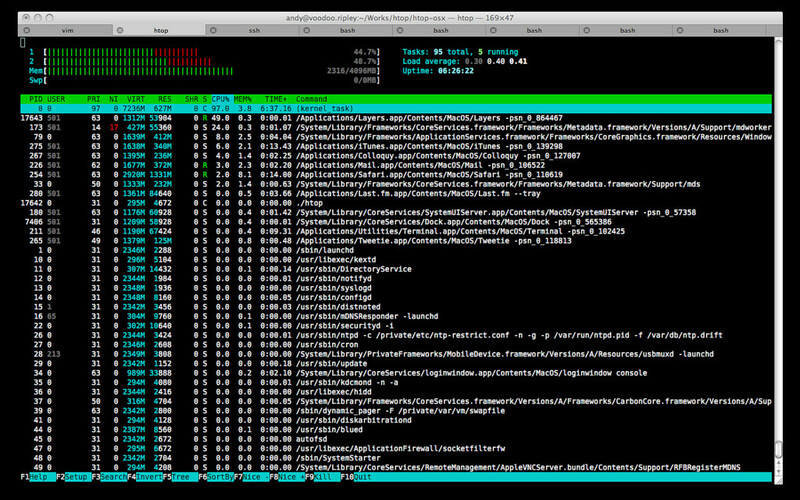 Top on OS X requires a little tweaking (it's not as 'blinged out' as GNU top), but it's easy to do. On Leopard or Tiger, I use 'top -FRo [field]', where '[field]' is typically cpu, vsize, rsize, and so on. The -F and -R options will sacrifice some precision for memory calculation for a huge decrease in CPU usage by top. Not the answer you're looking for? 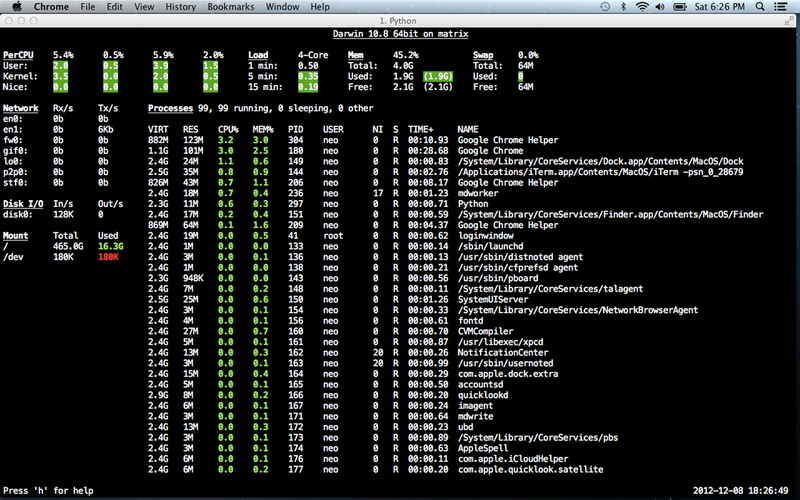 Browse other questions tagged monitoring mac-osx terminal or ask your own question. “top” style activity monitor for SQL Server? CPU (or Memory/etc) plugin for Munin and Mac OSX? Catch-all ACL attributes via CLI for Mac OS X? Is it possible to determine WiFi type with a Linux / Mac command? How to make the 'less' command handle UTF-8?